It is snowing right now! We definitely need it since February has been very sparse as far a snow...although wet initially. Since I'm seeing more, grainy, black and white images on "throw back Thursday" on FaceBook; I thought I'd include an image taken on Sagehen Creek...long ago. 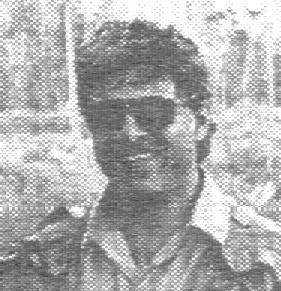 The super-grainy image was actually the first "head-shot" that appeared on my original web-site's home-page in '95. Obviously I didn't know much then ...and still remain techno-challenged...about the Internet and social media. Currently I'm doing my mid-winter preparation for my attendance at the Pleasanton Fly Fishing Show (www.flyfishingshow.com; February 26-28 2016). I'll be in the Truckee Guide NetWork booth and will be presenting at Destination Theater on Friday and Saturday. I've re-edited my PowerPoint with the new title being "Truckee Fly Fishing Options". I'll not include the original "Truckee-Tips" which has been part of past presentations. The "tips" are gleaned from my 33rd years of guiding and instructing exclusively in the Truckee area...."Simply experience counts". Both a printed "Truckee-Tips" and "Little Truckee Tips" will be available at the booth. Do come-by the booth and visit. I do enjoy being/displaying and talking at the regional outdoor and fly fishing shows. It is a great opportunity for "catching-up" with my long-time (as early as 1984), current guide, clinic and "tour" friends...and those adventurers who I fished with in southern Chilean Patagonia (7 of 8 years; 2004-2012). Unbelievably I've been doing shows since the late '80's. First, in San Francisco, I participated in the Great Outdoors Adventure Show for 3-4 years- sponsored by the San Francisco Chronicle. Then the once only Fly Rod and Reel magazine's Fly Show in San Francisco. Thereafter, for over a decade during the '90's into the early century I had a booth at the International Sportsmen's Exposition in San Mateo, CA. Since then I've appeared at the first Fly Fishing Show at the Civic Center in San Rafael CA. I still appear at the same Fly Fishing Show in Pleasanton CA. As I mentioned, I still cherish the opportunity of seeing old and new friends and meeting those people interested in being guided, attending skills clinics or signing-up for Native Sons Tours.